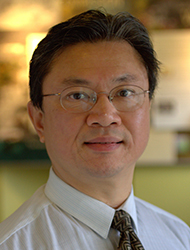 Dr. Apichai is a clinical supervisor at Bastyr Center for Natural Health and a core faculty member in the Department of Acupuncture and East Asian Medicine at Bastyr University. He also has a private practice in Seattle. Dr. Apichai serves as an advisor for the Traditional Chinese Medicine (TCM) Sports Medicine Club. Dr. Apichai believes the true cure is not medicine, but the healing power of nature. By correcting the diet, natural biological schedule and lifestyle, medicine serves as a guide on the road pointing to immortality. After Dr. Apichai received his Doctor of Medicine (MD) degree from Jinan University in 1992, where he also completed several medical internships and research projects. He joined the Tui Na Rehab Department at First Branch of Guangzhou TCM Hospital in 1993. Master of Science in Acupuncture from Bastyr University, 1997.